It isn’t just vampires. Once you invite any kind of evil entity into your home, it will be the devil’s own time getting rid of them. For some reason, demons from Hell are particularly keen to possess members of Ashley’s family. 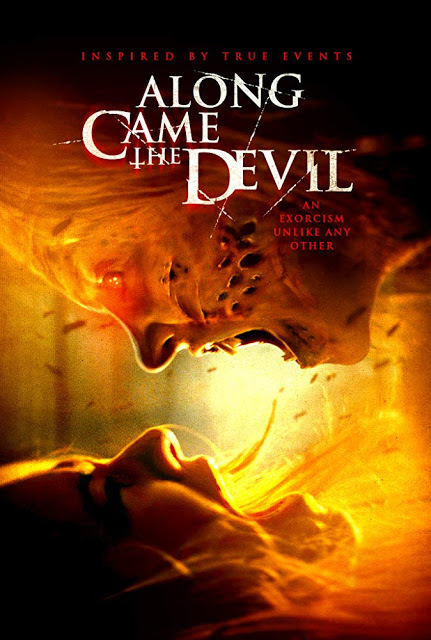 It could very well be her turn in Jason DeVan’s Along Came the Devil (trailer here), which opens today in Los Angeles. Dad was abusive and mom just up and disappeared. Now that her older sister Jordan is off at college, Ashley has returned her original hometown to live with Aunt Tanya Winbourne. Her old pal Hannah and the crushy lug who used to have a thing for her want to pick up where they left off. However, Ashley will quickly scare away everyone but Hannah with her crazy behavior. Alas, Hannah is fascinated with the occult, but knows just enough to put Ashley in dire jeopardy. Aunt Tanya is skeptical of the supernatural, but Reverend Michael has seen his share of demonic horrors. In fact, his spirit is hanging by a thread, which is why young and dynamic Pastor John handles most of the church’s day-to-day services. Of course, when the infernal chips are down, you want a seasoned demon-hunter like Rev. Michael performing the exorcism rituals. Along is a ultra-low-budget film that has its merits (and probably had even greater potential), but the execution is uneven. Sadly, there are several conspicuously missing scenes. The film starts with title cards to explain Ashley’s messy family history and references an incident in her class that we never see. We would guess the production had permission to film exteriors at the high school, but not interiors, so they just punted Ashley’s second freak-out scene. Still, there are some surprisingly compelling supporting turns, particularly TV veteran Madison Lintz (Walking Dead, Bosch), who shows big-screen-worthy presence and energy as Hannah. Bruce Davison is also terrific—looking like the personification of world-weariness as Rev. Michael. DeVan scores some deeply unsettling scares and just generally gets under the viewer’s skin, but he never really puts a unique stamp on the demonic horror subgenre. Still, the coda has some bitter bite to it that rather ironically reminds us of Charles Beaumont’s Twilight Zone episode, “The Howling Man.” Horror fans will appreciate the evil vibe, but Along still requires them to grade on a curve. Yet, we are more than willing to check out the next DeVan family joint, which is something. For horror addicts in need of a fix, it opens today (8/10) in LA, at the Laemmle Music Hall and also releases on VOD day-and-date, where it should do most of its business.